i can't believe i'm going to be in Vegas on Saturday! i'm working on getting everything organized to go... somehow that's always the toughest part of traveling for me. i think i've at least picked out what i'm going to wear... that's part of the battle down, at least! 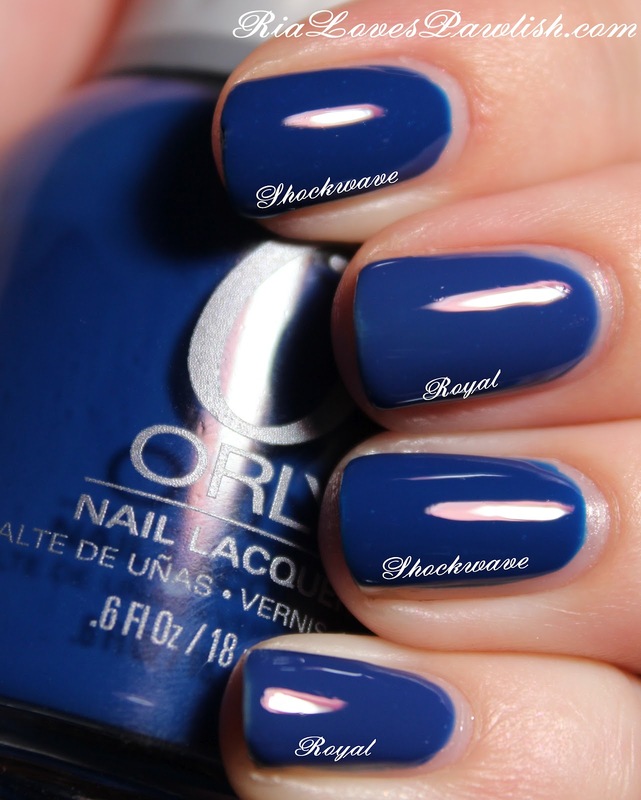 today we are going to compare Orly Shockwave to OPI Dating A Royal. Orly Shockwave is the last polish from their Electronica collection! as you can guess from one of the names, they are both a royal blue color in a creme finish. Dating A Royal has a slightly dustier tone, but they are close enough that you don't need both. the glaring difference between them is the formula... Shockwave has a great, pigmented formula that could be done in one thick coat (although i used two!). Dating A Royal has a thin, watery formula that takes three coats for full opacity. since i prefer the slightly richer tone of Shockwave, it's formula makes it the clear choice in my opinion! one coat Orly Nailtrition, two coats Shockwave ring/pointer & three coats DAR pinky/middle, one coat Seche Vite.